For the past two years we’ve lived in the garden apartment of a sturdy, thoughtfully restored brownstone on one of those quintessential Brooklyn blocks. A leafy stretch where a perfect kick-line of brawny brick homes crowned in regal cornices lead to the park. It’s been a charmed run, and we know it. We’ve been lucky enough to have more than landlords living above us, but friends, too. Even if we are an unlikely match. Us: hailing from the Midwest, writers and vaguely Christian. Them: Russian-born immigrants who are doctors and Jewish. There’s a sitcom in there somewhere, complete with an episode where the parents come downstairs to raid the honey baked ham and shrimp cocktail we had on offer at our Christmas Eve party. We share the usual neighborly provisions of sugar or eggs, and we watch one another’s children in a pinch. Having doctors on call was helpful when our toddler took a temple-leading leap into a coffee table. And they appreciated help from an in-house editor to review speeches for their oldest son’s bar mitzvah. Beyond that though, the above shots are a glimpse at just how much we’ve blended lives and learned from one another’s stories, traditions and cultures. 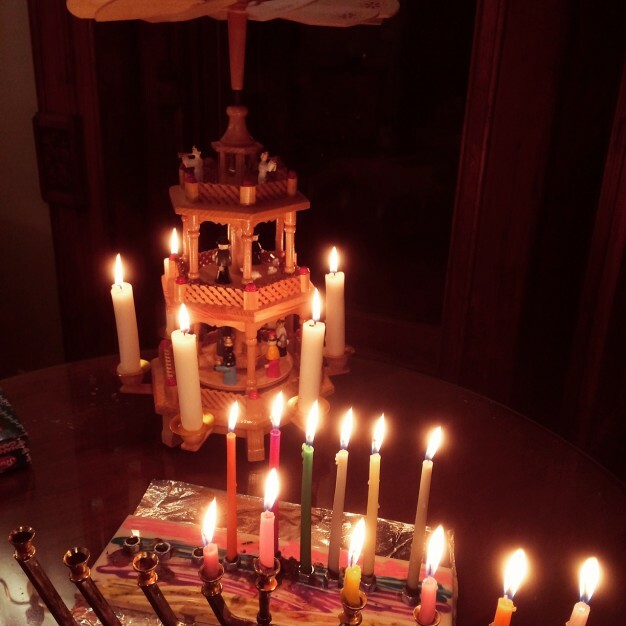 One holiday evening we lit the Christmas pyramid and two menorahs in the window as we discussed the significance behind those stories and the importance of light. We popped open Christmas crackers (a UK tradition) and swapped the silly jokes inside as we passed around plates of latkes (three glorious kinds), pickles, Russian herring salad and my new favorite: pirozhki. And despite the fact that the house is being sold and we’ll all be moving, I hope that we can make this gathering a holiday tradition for years to come…. 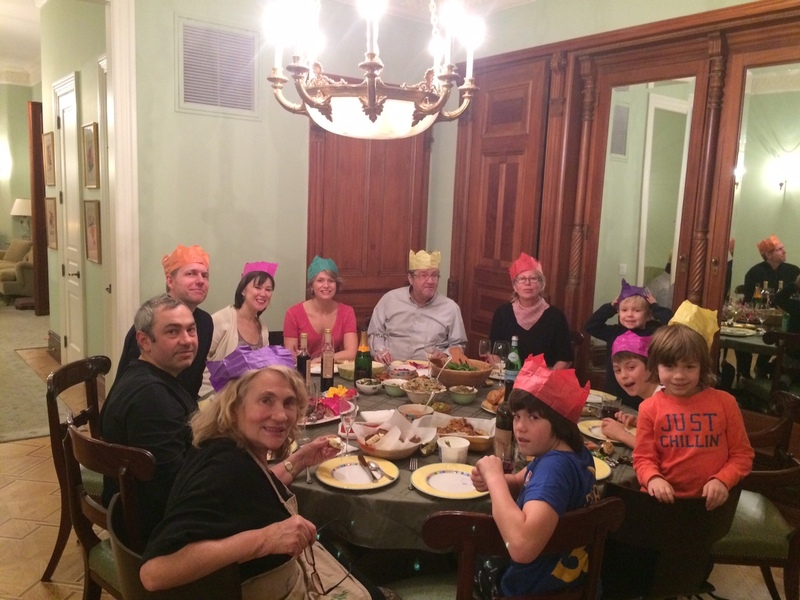 This entry was posted in create and tagged bar mitzvah, Brooklyn, Christmas, Christmas crackers, Christmas pyramid, family, Hanukkah, latke, menorah, neighbors, traditions by lhouse. Bookmark the permalink.